Harry Brown (Michael Caine), an ex-marine and Northern Island pensioner, lives in a much maligned apartment block in South London that is overrun by violent youths. His wife is dying in the hospital and his best mate, Leonard (David Bradley) - with whom he plays chess with in the local pub, is intensely frightened by the goings on in their neighbourhood, and feels forced to carry around an old bayonet for protection. Harry visits his wife everyday, but always avoids a quicker route to the hospital via an underpass, as it is a favourite hang out of the aggressive troublemakers. This proves costly as one night he receives a phone call alerting him to his wife’s worsening health. Avoiding the shortcut again, he arrives too late to find she has died. On top of this, a few days later, Leonard is accosted after a gang of youths vandalise his home and is murdered by his own weapon. This proves too much for Harry and his disheartening faith in a weak police effort to do something leads him to take methods into his own hands. The film is the debut from director Daniel Barber. It’s a simple story, but his previous background in commercials comes through in Harry Brown, as the camera movement is stark, but fluid. The editing precise. It is classic stylish filmmaking and the film is much better for it. The only “shaky” cam we get here is in a shocking home video pre-credits sequence. This intro sets the tone, and Brown doesn’t pull its punches when it comes to its violence. Some CGI blood looks a bit out of place in moments, but its graphic nature cannot be denied, though in no way does it really come off as gratuitous. It earns its Death Wish comparisons for sure, but this is no brainless action entity either. Its moral code is questionable, but not alarmingly so. The film takes itself very seriously and strives for realism in all aspects. It is a shame then that in some ways Brown is a bit far fetched. Of course, sacrifices sometimes need to be made to forward a plot, but when a film invests as much in its emotion as it does here in its beginnings, a stumbling police sub plot and motive hinders the script occasionally. A weak plot point towards the end is used for a tense (if cliched) final act, but comes off more as a tacked on device rather than having any sort of relevance. Surprisingly, these things still do not really take off any of the emotional weight the film carries itself on from the get go. Martin Phipps dreary, manipulative score helps to keep you there, but it is Michael Caine at its centre that makes it all work. 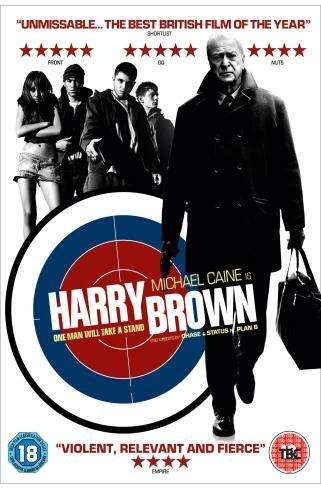 Caine’s Harry is yet another notch for the veteran actor’s belt. His transformation from weak, frightened senior citizen to calculated avenger is realised excellently. His performance is a classic slow burn achievement. Rather than pushing, Barber trusts his star and Caine’s emotional nuances and at times intense scripting help Harry Brown achieve a believability through his acting. Emily Mortimer gets a majority of the screen time besides Caine, and her role as a police detective alongside partner Charles Creed-Miles is solid enough to be convincing. The several gang members are played with disturbing authenticity, which ramps up the intensity whenever they are on screen. Also good is Liam Cunningham as pub owner, Sid. A small but pivotal role in the drama. Overall, I enjoyed Harry Brown a lot. It is an extremely stylish, dark and heavy hitting revenge drama. It will not sit well for some casual viewers to be sure, but as a human justice thriller for adults, it is a healthy addition to the genre. For Daniel Barber, its young debut director - albeit aided by one of Britain’s finest actors, it is an impressive first film and definite step in the right direction.